An IDF soldier's letter from the front. From a Solider at the Front. Original in Hebrew....translated into English with a few comments from me. Having been down there a few times, I can personally vouch for the accuracy of this letter. On a personal note, before going down South last night for a pizza delivery to IDF soldiers, my daughter gave me a stack of letters and pictures from children in our community to distribute to the delivery. After giving the soldiers 60 pies, I said, "Wait, I have to give you the letters from the kids..." A soldier stopped everything and said -- "THOSE are the most important...much more than the pizza...and hugged a pile of letters that I gave him." Almost every hour a car shows up overflowing with food, snacks, cold drinks, socks, underwear, undershirts, hygiene supplies, wipes, cigarettes, backgammon and more. They're coming from the North and the Center, from manufacturers, from companies and private businesses, from prisons, Chareidim and Settlers, from Tel Aviv and even Saviyon. Every intersection on they way down here we get stopped, not by the police, but be residents giving out food. What is amazing is that the entire situation wasn't organized and everyone is coming on their own without coordination between the folks coming. They're writing letters and blessings, how they're thinking of us all the time. There are those who spent hours making sandwiches, so they're as perfect and comforting as possible. Of course representatives of Chabad are here to help soldiers put on Tefillin and distributing Cha'Ta'Ts (Chumash, Tehillim, Tanya) for every troop transport and Breslov are showing up to the border and dancing with the soldiers with great joy. It goes without saying the amount of prayer services that are going on. On the religious front as well, there are lectures and Torah classes, all the food is obviously Kosher. Shachrit, Mincha, and Maariv with Sifrei Torah. They're giving out tzitzit and Tehilim by the hundreds. It's become the new fashion! The Rabbi of Maglan [Special Forces unit] told me that almost the entire unit has started wearing them, because the Army Rabbinate has been giving out tzitzit that wick away sweat. They're gaining both a Mitzva and a high quality undershirt. We've started calling them "Shachpatzitzti" (a portmanteau of the Hebrew term for body armor and tzitzit). We're having deep conversations late into the night without arguments, without fights and we find ourselves agreeing on most stuff. Don't Lose the Psychological Warfare battle to Hamas. The current Israel-Hamas war is being fought on many battlefields. Our IDF soldiers are bravely fighting in and around, under and over Gaza by land, sea and air. There is also another battle going on -- and you readers are all participants. Its the psychological warfare battle being waged by Hamas and their allies around the globe, against us. People are posting everywhere a Hamas released photo of an "alleged" kidnapping of an IDF soldier. People see this, decide it's fact, and then get deeper into depression. Ostensibly. 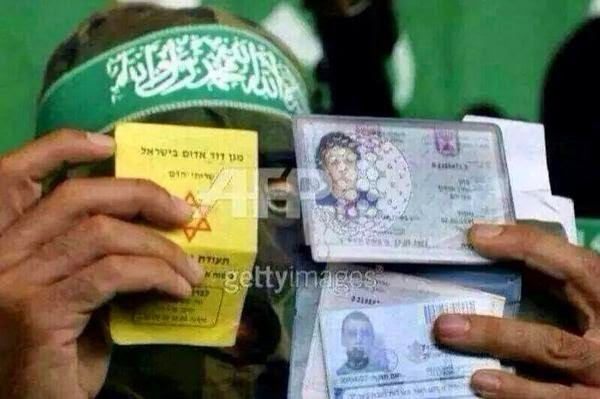 Hamas is "proving" that they have a kidnapped soldier. However...this is psychological warfare. The exact same photo appears already on 06-05-2013. There this photo can't possibly have anything to do with the alleged "kidnapping." Here is a source for photo when it was used over a year ago... link. 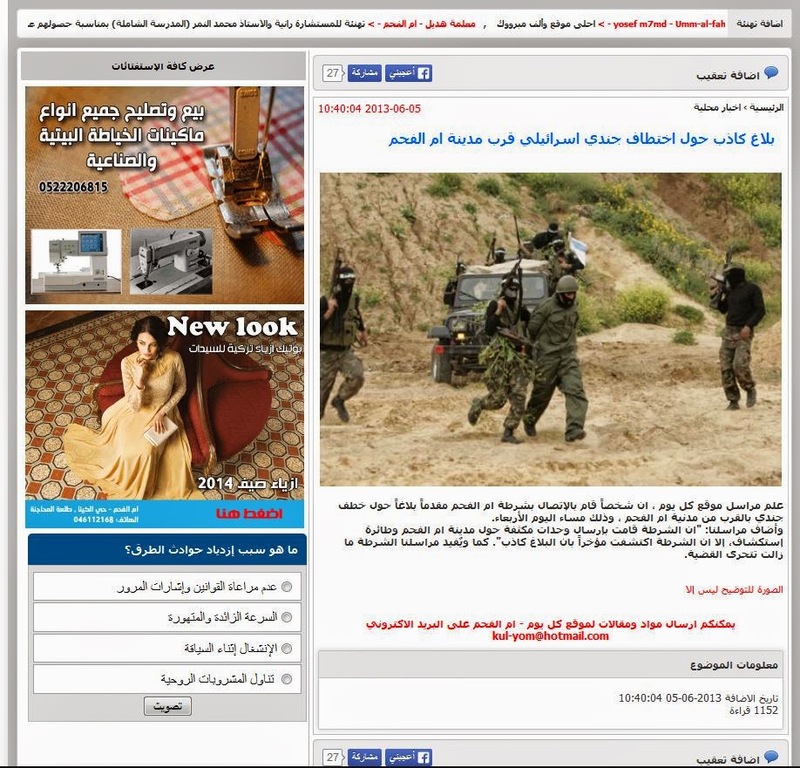 Hoax about the kidnapping of an Israeli soldier near the city of Umm el-FahmReporter learned site every day, that someone has contacted police Umm al-Fahm in advance tip about the kidnapping of a soldier near a civilian Umm el-Fahm, and so on Wednesday evening. Our correspondent added: "The police has sent units intense around the city of Umm al-Fahm and explore the plane, but that police recently discovered that a hoax." According to our correspondent, as police are still investigating the case. Hamas has shown repeatedly and throughout the web the following photo as proof of the IDF soldier's kidnapping. However...soldiers don't carry their National ID card with them into battle. And more so, the Hamas already tried using this exact same photo in 2012. See the link here, when they tried using it in Operation Pillar of Defense. Hamas has created a FAKE twitter ID for the soldier and are posting out tweets from it. Don't believe it. 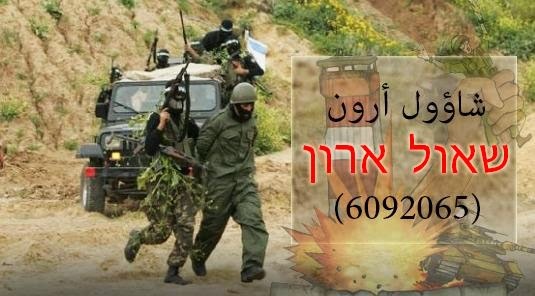 Hamas has created a movie based on photos from the soldier's Facebook page. NONE of the above are actual facts that point to Hamas actually holding a kidnapped soldier. Don't fall for it....and we win. Thanks to our friends at rotter.net for some of the above information. During the past month, the Muqata staff has ramped up the live blogging effort from Israel and is live blogging and providing commentary on the ongoing war from Gaza. In the Rolling Hills of the Shomron.